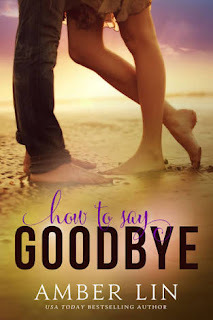 How To Say Goodbye is a new adult romance by author Amber Lin. This was my first time reading a book by Amber and personally I did enjoy her writing style as it was well conceived and the story was different from the cliche books we find in the adult romance genre. Even with her flawless writing I was unable to connect with the main characters, Amy and Dane because I found it difficult to believe that someone can grow up with barely being touched and that a man who has been living on the streets for so many years can still be so kind and caring. Amber, however has tried her best while writing this book and I commend her for trying to do something out of the box. Amy has always been the model student who has received straight A's, but no one knows her secret that she has never been hugged and no one has ever held her hand. One day on her way home from her internship she meets Dane, a blonde surfer boy who lives on the streets. She begins to feel this instant pull and attraction to Dane which she cannot explain. Dane believes he doesn't deserve Amy because of his past that haunts him. These two make their way towards each other while fighting their demons that are holding them back.